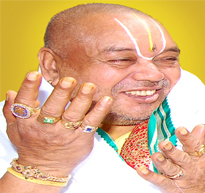 Sri Sri Sadagopa Ramanuja Peeda Jeeyar Swamigal. 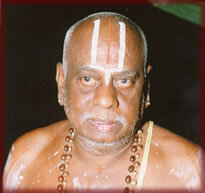 The Maha Samprokshanam of the THEN-THIRUMALAI Sri Venkateswaraswamy Vari Temple was performed on February 28, 2001. The festivals lasted five days commencing February 24, 2001. 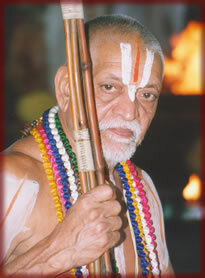 In view of the importance, divinity and serenity of this location and the earnestness of the devotees in the establishment of this new Abode for Lord Srinivasa as in Tirumala, the Tirumala-Tirupati Devasthanams deputed as a special case a team of High Priests and senior Archakas to perform the Maha Samprokshanam. 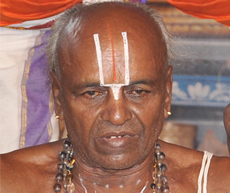 On all the five days, over 100 Vedic scholars from Vaishnavite centres-Tirupati, Kanchipuram, Kumbakonam, Srirangam and Madurai performed the yagnas in a specially erected Pandal where the Yaga kundams had been constructed according to the Agamas. 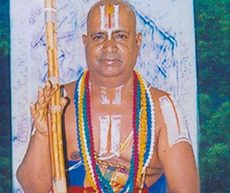 On the final day, the sanctified holy waters from the Ganga, Cauvery and Bhavani kept in the Yagasala were taken round in procession to the accompaniment of chanting of Mantras and Nadaswaram Music. Assisted by Sri Ranga Ramanuja Periya Jeeyar Swamigal of the Tirumala-Tirupati Temples and hundreds of vedic scholars, the Head Priest and Agama Advisor of Tirumala-Tirupati Devasthanams Madambakkam Sri Srinivasa Bhattacharya Swamigal carried the GOLD POT containing the holy waters to the top of the Temple Gopuram and performed the Mahasamprokshanam to the chanting of "Govindha, Venkatesa, Srinivasa" from thousands of worshippers who had thronged the Temple. Senior Officers of the Andhra Pradesh Government - Executive Officer of Tirumala-Tirupati Devasthanams Shri P Krishnaiah IAS, Commissioner of Commercial Taxes, Shri N Rameshkumar IAS, Principal Secretary Industries Department and Shri T Gopal Rao IAS witnessed the Maha Samprokshanam festivals. Lord Maha Vishnu of Vaikundam has an abode in Tirumala-Tirupati for saving his devotees, As if He has built an abode at Then-Thirumalai for blessing all his devotees.